The GSA12D Gas Spring Monitor Stand mounts two LCD/LED monitors on the desktop via a desk clamp. It is ideal for organisations and professions where frequent adjustment of monitor height and position is important. Featuring Gas Spring technology, the GSA12D monitor stand makes it possible to change the monitors' height/position in 1 second (yes, SECOND). Simply use your hand to move the monitor around to the position you desire and it floats there like magic, NO tools required! The GSA12D is also ideal for situations where your monitors need to be set to very specific locations, and features additional diagonal arms for increased adjustability. If your organisation needs a stand which can be easily manipulated then look no further. The GSA12D has two monitor arms + two diagonal arm extensions, so the monitors can reach anywhere within ~ 57cm/22.5" radius: left and right, up and forward. 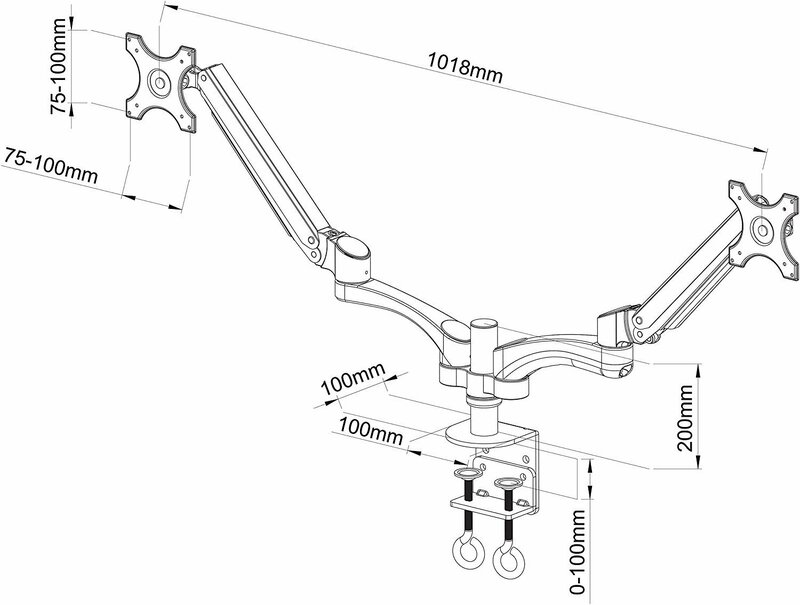 Universal, fits LED/LCD monitors with VESA 75 or 100 mounting holes AND weight between 1.5 to 6 Kgs, will accept almost all monitors between 13" up to 27"
The Allcam gas spring series of monitor stand is similar to the Ergotron LX and MX premium series' of monitor mounts but only half the cost, and much easier to assemble; anyone with a little DIY experience can mount a monitor in 5 mins instead of the 30 mins needed for Ergotron stands. Concerned with the quality? Allcam has 10 years of experience in designing TV/monitor stands, we are so confident with the quality of our products that we provide 5 years warranty on all our monitor stands. These GSA12 Series LCD monitor stands come brand new in sealed box, with 5 years warranty.